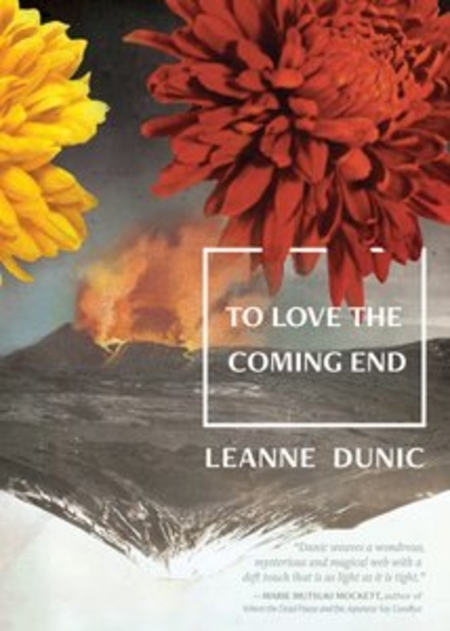 I had to read Leanne Dunic's slender book, To Love the Coming End, twice to get some sense of the tale contained within what others have called lyric prose. This was certainly not a traditional prose narrative, but rather a fragmentary collection of short meditations with a tenuous story running through them. The unnamed narrator, an author, traveling to and remembering Japan, Singapore, and British Columbia, writes of loss and her missing or absent lover. She weaves heat, place, and the geological disaster of the 2011 earthquake and tsunami in with this self-defining emptiness, this unrelenting void and explicitly draws the reader to the number eleven, not only as a date and a whole number itself but also as a figure of two ones, two people standing together and yet parallel, never coming together, separating in fact. There is a sense here of both connection to the natural world and a dislocation, a loneliness, and a sorrow of incompleteness as well. The language is confounding, hiding as much as it reveals. I had a difficult time connecting with the book. Many of the short, almost prose poems, felt like simply window dressing, a building of atmosphere for what, in the end, was a quite modest and even pedestrian story. Those who enjoy experimental prose/poetry will certainly enjoy this far more than I did, probably find more meaning in it, and can feel quite confident in their intellect surpassing mine as I've clearly struggled with this. Maybe on reads three or four I'd come to a better appreciation but I don't really want to try and tease out any additional meaning and that probably says it all.